Since having my fringe cut in a couple of months ago, I have been rediscovering the need for a good hairspray. I started off using L'Oreal Elnett - you can read my review of that here - but when it ran out I was looking for a new one, and found that Elle magazine were giving away a mini bottle of Bumble & bumble's Thickening Hairspray with their September issue. I don't normally buy magazines just because of the freebie, but I'd heard good things about their Salt Spray so figured I'd give this one a whirl to see if I liked the products. In terms of the packaging, it's a small translucent bottle with a black pump lid and pale blue and black writing. I like that it has a very clean look to it, with no mess or fuss, which to me always suggests that the money has gone into developing a really great product than into fancy packaging (don't get me wrong though, I do like a pretty container as well!). It's a good size too - I feel like I'd be quite happy to toss it into my handbag for a touch-up after work if I was going out or if I was going away for the weekend - and the simplicity of the bottle makes it look very attractive. In the packaging, the product looks like a clear liquid, but does foam a little on the top when you shake it up. To apply, shake the bottle and then spray onto your hair, then run your straighteners or other heat styling tools over it - I sprayed mine all over as I mainly use it to set my fringe but also with the rest of my hair on particularly windy days, and we've had quite a few of those recently! In terms of consistency it was quite fine. It made my hands feel a bit sticky afterwards though, but that seems to be par for the course with hairspray. You can also use it before blow-drying. The smell was a little bit chemically - I think it was meant to be floral but I actually found it slightly cloying. Then again, I openly admit I don't buy hairspray because it smells nice, because they so rarely do, and often the ones that do don't work so well anyway, so I wasn't really so bothered about that. In terms of durability, it did hold my style the whole day and didn't make my hair too greasy, as well as brushing out nicely at the end of the day. However I quite often found that it tended to set in patches, especially if I didn't straighten my hair afterwards, which surely defeats the object of a hairspray. Unless the point was you're meant to spray it over your entire head, inch by inch, but who has time for that in the morning before work? I also didn't find it gave my roots much boost either, but instead tended to weigh them down and often made my hair look a bit lank and horrible. Ultimately, although the spray did hold my hairstyle and the packaging is lovely, I just couldn't get on with this product. And, at £7.50 for a 50ml bottle or £21.50 for 250ml, I think I'll be sticking with my trusty Elnett. After I've picked my jaw up off the floor at those prices. 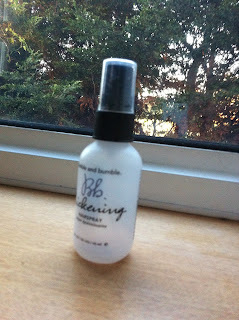 If you fancy trying this hairspray you can buy it via the Bumble and bumble website, Lookfantastic.com, Boots or Amazon. Have you tried this or any other Bumble & bumble products? What did you think of them? And have you tried any beauty products recently that you just couldn't get on with? Let me know in the comments and have a great day!